Ayr United moved back up to third in the Championship thanks to a lovely curling effort from Declan McDaid at East End Park. 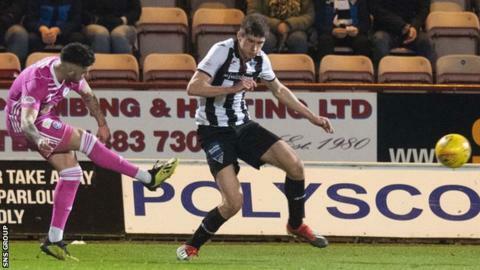 Lawrence Shankland was twice denied by Dunfermline goalkeeper Ryan Scully as the visitors sought a second goal. Dunfermline rallied, with Danny Devine and Louis Longridge going close before Bruce Anderson blasted a last-minute chance over the crossbar. Ayr are now nine points behind Dundee United with two games in hand. Dunfermline remain fifth, four points behind Inverness Caley Thistle, after back-to-back home defeats. Ian McCall's visitors had gone into the match on the back of a poor run, with just one win in six games, but they dominated the first hour in Fife. The only goal arrived on 31 minutes with McDaid swing a shot into the right-hand side of the net from the left of the box. Shankland shot straight at Scully just before half-time and was later denied by the keeper in a one-on-one situation. Dunfermline had chances to rescue a point, with Devine shooting over from a Faissal El Bakhtaoui flick-on, while Longridge had two shots stopped by Ross Doohan before Anderson's glaring late miss. Ayr United manager Ian McCall: "That was a big win for us - it was a very nervous last five minutes but I don't think anyone would say we didn't deserve to win. I'm disappointed we weren't three or four goals ahead at that point. "There was one clear chance for Dunfermline at the end but it would've been a travesty if we hadn't taken all three points. "If we can make the play-offs, that would be fantastic. We go again on Tuesday night against Morton, which will be tough." Dunfermline manager Stevie Crawford: "It's bitterly disappointing. There's a way of losing football, our first half was unacceptable. They came and dominated. I'm not pointing the finger but collectively they outdid us. "If you don't work hard enough or do jobs properly you get punished. We didn't get the rub of the green but the first half performance wasn't good enough." Match ends, Dunfermline Athletic 0, Ayr United 1. Faissal El Bakhtaoui (Dunfermline Athletic) is shown the yellow card. Mark Kerr (Ayr United) is shown the yellow card. Second Half ends, Dunfermline Athletic 0, Ayr United 1. Faissal El Bakhtaoui (Dunfermline Athletic) wins a free kick on the right wing. Substitution, Ayr United. Ross Docherty replaces Declan McDaid. Attempt missed. Bruce Anderson (Dunfermline Athletic) right footed shot from the centre of the box is high and wide to the right. Corner, Dunfermline Athletic. Conceded by Ross Doohan. Attempt saved. Louis Longridge (Dunfermline Athletic) right footed shot from the centre of the box is saved in the top right corner. Lewis McCann (Dunfermline Athletic) wins a free kick in the attacking half. Attempt missed. Faissal El Bakhtaoui (Dunfermline Athletic) right footed shot from the centre of the box misses to the right. Mark Kerr (Ayr United) wins a free kick in the defensive half. Liam Smith (Ayr United) wins a free kick in the attacking half. Bruce Anderson (Dunfermline Athletic) wins a free kick in the defensive half. Foul by Ryan Williamson (Dunfermline Athletic). Declan McDaid (Ayr United) wins a free kick in the attacking half. Foul by Jackson Longridge (Dunfermline Athletic). Attempt missed. Danny Devine (Dunfermline Athletic) left footed shot from the left side of the box is close, but misses to the left. Corner, Dunfermline Athletic. Conceded by Steven Bell. Substitution, Dunfermline Athletic. Matthew Todd replaces James Vincent. Substitution, Ayr United. Calvin Miller replaces Lawrence Shankland. Attempt missed. Lawrence Shankland (Ayr United) right footed shot from outside the box is too high from a direct free kick. Corner, Ayr United. Conceded by Tom Beadling. Jackson Longridge (Dunfermline Athletic) wins a free kick on the right wing. Foul by Mark Kerr (Ayr United). Danny Devine (Dunfermline Athletic) is shown the yellow card for a bad foul. Michael Moffat (Ayr United) wins a free kick in the attacking half. Attempt missed. Faissal El Bakhtaoui (Dunfermline Athletic) right footed shot from a difficult angle on the left is close, but misses to the left.